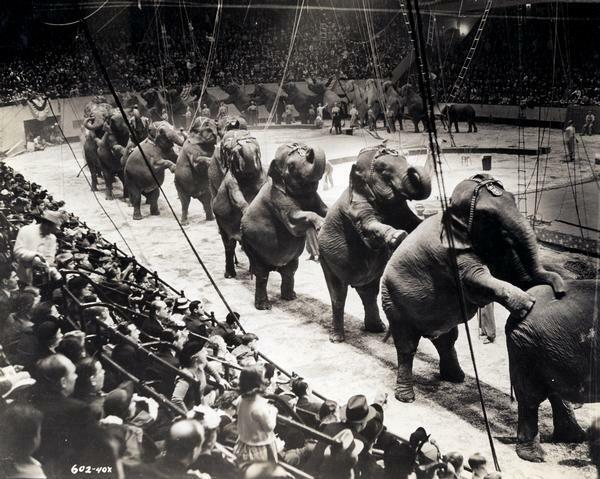 Take a visual trip back in time to see what the circus was like from the 1860s to the 1960s. A wide range of circus activities are depicted in this selection of over 100 photographs. These images illustrate the excitement as well as the hard work that went into putting on the show. Included are performers, clowns, animals, wagons, several posters and many behind-the-scenes shots. In the United States, the circus as we know it began when Thomas Pool introduced the clown to his equestrian entertainment exhibit in Philadelphia in 1785. By the 1830s the traveling circus was developing into a major source of entertainment, especially for people in rural areas. The expansion of the railroads across the country led to the Golden Age of the Circus in the 1880s. It was then that Wisconsin became a major player in the circus world. Not only did the world-famous Ringling Brothers get their start in Baraboo in 1875, they helped their cousins, the Gollmar Brothers, create their own circus there in 1891. Beginning in the 1870s, the George W. Hall family circuses made their home in Evansville. In 1905 there were 100 traveling circus shows in the U.S. and their popularity continued to grow. Television drastically cut into the audience base during the 1950s, however, and today there are fewer than two dozen circuses operating in the U.S.